Amy Freeze Arbuckle (BA ’95) spent a considerable part of her life, including her years at BYU, as a die-hard cheerleader. More athlete than dancer, she was the cheerleader others tossed in the air. While on the BYU squad, she met Gary R. Arbuckle Jr. (BS ’95), one of the school’s Cosmo mascots, and enjoyed a courtship when he became a yell leader to spend time with her. Now married to Gary, Amy finds plenty to cheer about as the mother of three young Arbuckles, but her professional reputation has come from being a Freeze. Turns out, she loved being “it.” She went on to earn a degree in meteorology from Mississippi State University and is currently finishing her master’s degree in environmental science with an emphasis in storm-water management from the University of Pennsylvania. 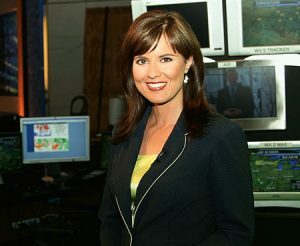 Along the way, she has become one of few women to receive the American Meteorological Society’s Certified Broadcast Meteorologist accreditation. While news work in Portland, Ore.; Denver; and Philadelphia has led to two regional Emmy awards for best weathercaster and outstanding host, she is acutely aware of the challenges and opportunities she faces in her current job as chief meteorologist for Fox News Chicago. But Freeze is hardly outclassed. Her education and knowledge of new technology prepared her to work on Fox’s sophisticated dual-polarity radar unit. Far less common than conventional Doppler radar systems, it “sees through” storms better by sending out microwaves in two pulses—rather than one. Despite her other obligations, Freeze finds time to stay fit. She runs marathons, does strength training, and follows Bill Phillips’ Body for Life program, a family exercise, eating, and wellness approach. In 1999 she and Gary won the couples division in the national Body for Life fitness contest. “We’re not perfect, but our goal is to live a rich family life and a life with balance,” she explains. And that, she believes, is plenty to cheer about.